While some children begin showing some characteristics of empathy during infancy, kids are generally born with the concept that they are the center of the universe. Anyone who has spent any significant amount of time with a baby knows they are pretty consistently egocentric. They are acutely aware of their needs and have very little concern for the comfort of others (think 3AM feedings). Luckily, this sense of self-preservation above all else is relatively short lived. Newborn babies know nothing (that we know of) about the feelings of others, but almost all babies will cry in response to another baby’s wails. Whether that is a show of empathy or an instinctive mimicry, we’re not sure. Most people think empathy is a character trait that you either have or you don’t, but that is far from the truth. Here are 5 easy ways for parents, teachers, and other caregivers to encourage empathy in children as part of their daily routine. To be able to understand how another person is responding to their situation, we must be aware of our own feelings. A child who knows when he is frustrated is considerably more likely to be able to recognize frustration in someone else. Our job as parents is to teach our kids the words for what they are feeling and that emotions are completely natural. Saying something as simple as, “I can tell you’re frustrated that your sister won’t share her blocks” shows that what they are feeling not only has a name, but is something his parent can relate to. In a similar situation, this child can now better recognize frustration in another child, having experienced the feeling themselves. Older children should be taught more complex emotions as the situations arise. “You looked like you were feeling shy when we ran into Mommy’s friends at the mall” or “I felt anxious when I missed my turn” are easy ways to share the names for specific feelings. The kids can then more easily help others in similar situations by understanding how they are feeling and remembering tools (i.e. a hug or a deep breath) that were used to deal with their own emotions. Kids are always paying attention. Don’t get me wrong, they’re not always listening to you when you’re telling them to clean their room or that one cookie is enough, but they’re constantly absorbing their world. Being a good role model in terms of empathy means that we need to show them how to be kind to others in everyday situations. For example, how do you respond when your spouse comes home from work in a bad mood? Do you talk to them to see if you can help ease their mind? Or do you snap at them for having the audacity to bring their terrible mood into your presence? It’s virtually impossible to raise children without having them experience conflict. While constant fighting is detrimental to a child’s well-being, avoiding conflict altogether can also have a negative impact. Conflict is a fact of life; kids rely on us to teach them how to resolve these unpleasant situations. When we talk about our differences and can see the other’s perspective and compromise when feasible, we show that it’s ok to have different ideas. The goal is to be able to resolve these conflicts without belittling or demeaning the other person. It’s not enough to be able to put yourself in another’s position. To understand another person’s circumstances and then make an effort to improve their situation rises above empathy to the level of compassion. Even very young children can do this; just take a recent personal example from a preschool classroom for evidence. Subbing at my daughter’s pre-K last year, I witnessed an almost shocking example of empathy for such a young child. During story time in the 3-year-old class, a little boy burst into tears when the spot he was headed for on the carpet was taken right as he got there. Before I could even begin to move in his direction, another 3-year-old from the class had him by the hand. She smiled up at him and led him to an empty spot next to her on the rug. The boy smiled back at her while his tears were still wet on his cheeks. This 3-year-old girl was able to notice a disturbance not related to her, assess the situation and understand that the boy was upset by having someone sit in “his” spot, and offer a solution that solved the seating problem and comforted the crying child. That’s impressive for an adult, let alone a 3-year-old! Place your kids in situations that allow them to be empathetic. It’s fairly easy for a child to understand how someone similar to themselves would feel in a situation she had experienced before. However, the more removed a kid is from another person, whether it be because of age, race or socioeconomic status, the easier it is for them to look the other way. Find ways to volunteer in your community and bring the kids with you. Homelessness can easily be a concept that is unfathomable to a 7-year-old who has lived in the same house since birth. However, helping those who live without shelter, food, or access to medical attention shows them that not everyone is as fortunate. Take your child to volunteer at a soup kitchen; while they get to know the people they are helping, your kid becomes better able to understand what it means to go without. The act of helping can be an exercise in being sympathetic to an unfamiliar plight while also effectively improving the quality of life for another person. It’s no surprise that rewarding positive behavior is a great teaching tool. In the case of teaching empathy, an explanation during the reward will increase the likelihood of future compassionate acts. Instead of punishing a child for not being sensitive to another’s feelings, we need to catch them in the act of kindness and let them know that they responded in a way that was helpful. “Jimmy looked upset when his ball was stuck in the tree. I saw you give him a hug. It looked like that made him feel better.” Especially for younger kids, a lengthy praise session isn’t necessary. Describe the situation you saw, name the emotions, and praise the child for their effort to help. They’ll be even more inclined to offer a hand next time. As our babies grow up, their level of empathy will determine how they respond to situations on a daily basis. An empathetic child is considerably less likely to bully others. He will also be more likely to stand up for another child who is being made fun of, teased, or even physically assaulted. Take every opportunity you can to show your child that he has the power to make someone’s day better by showing genuine concern and offering to help. Parents want their kids to be good people. Admittedly, to be a “good person” is a vague concept and the qualifications are different for everyone. Most parents will also agree that they want their children to be kind to others. Teach her early and often that she can help people every day through understanding and compassion. Small steps now will likely have a huge impact throughout your child’s entire life. 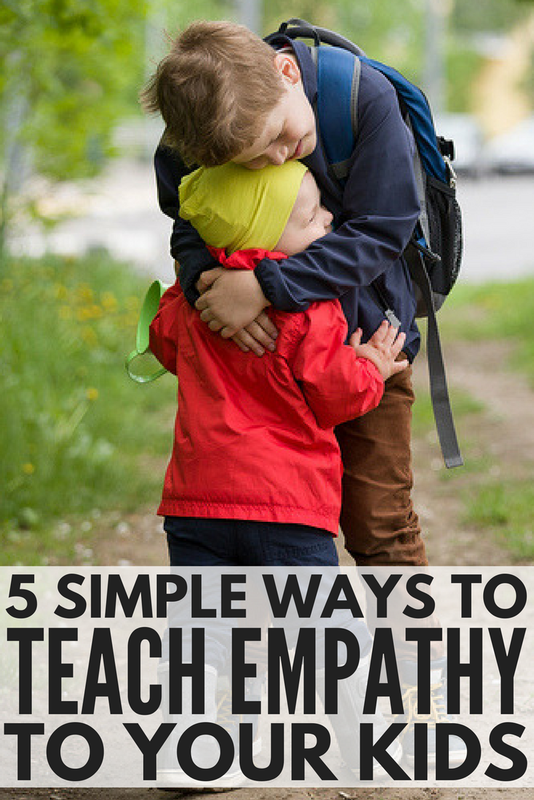 If you found this collection of tips for developing empathy in children helpful, please share it on Pinterest! And if you’re looking for more parenting tips and tricks, please follow our Parenting board where we share all kinds of fabulousness! Mandi is a wife, mommy and bonus mom. When she’s not busy agonizing over writing a bio, you can find her building her blog, Ginger Snapped Back, or working as a Virtual Assistant writing about kids, marriage, mental health, pets…life. She can sing every word to every song that came out in the 90’s but can’t remember if trash day is on Wednesday or Thursday.